Sure , everyone knows that a Mass Storage Driver for a Virtual device, BTW not fully integrated into NT, is EXACTLY the same as HID hardware device drivers. So would it be possible to use XP WHQL drivers also in Win7, with the above mentioned fixes? If they are 64bit drivers. If 32bit, they will not ever work under 64bit OS. And where can i turn off the enforced driver signing? Also, would i need to keep enforced driver signing disabled also after the install or is during the install good enough? You will need to have it constantly disable, as far as I'm aware. You can manually press F8 at boot every time you want it disabled. Or use one of the utils in the above thread. yippiiee, back to win98 days. 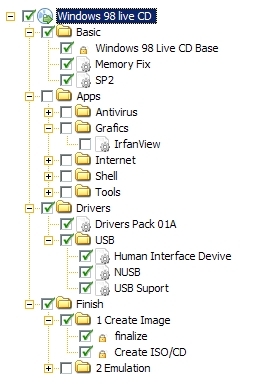 if you have network drivers and SCSI drivers (win9x) for your computer, put them in the TEMP\WIN98 dir (all uncompressed) and run the script "CD\DVD\USB" to create a new ISO. Sorry for late respond, trying things took time. as I wrote on other topic, I do not have dvdrw or cdrw for a while. I tried ufd-chip-isoadding trick (which took time) but did not work (well no surprise, it is not a perfect trick ). Thanks a lot BeatZero for the new package. I like the Project because its small and NTFS-reading. 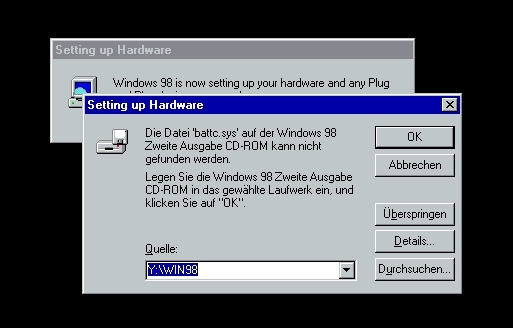 I built an ISO with -BASIC, -DRIVERS, -FINISH Elements, using German WIN98-CD. 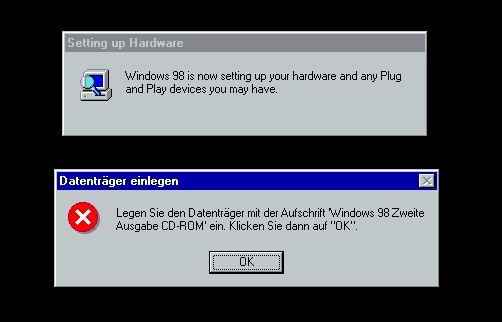 I get a message while "Setting up Hardware"-Section telling me to insert win98-CD. 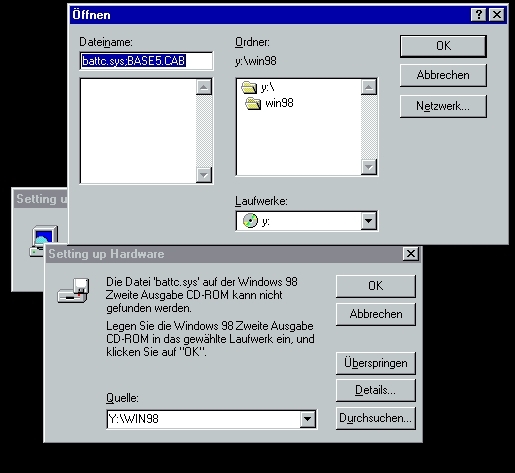 To avoid inserting Extra WIN98-CD I include the missing "BASE5.CAB" into the Win98LiveCD-Folder WIN98 and rebuild the ISO. By testing I checked that "BASE5.CAB" is the only extra-file responsable for successful booting. But although the "BASE5.CAB" is present, the boot-process fails, leaving an errrormessage. Maybe anyone has the same experience and found a way to solve the issue. - will english CD fix it ? - I´ll try and get one anyway. on emulation, this is the detail that I took much time ... to start the project, but so far, the only emulators that work well is the VMWare and VirtualPC. With qemu getting good results, but there were problems with the cdrom drive. With VirtualBox a lot of problems, including this one that you report. and found that Your Build is working well - on older PC . If I try to boot on SATA-equipped System even from IDE-CDROM it hangs (Prompting: No archive found. A:\> ). No SATA-CDROM Driver I guess. I will do some testing later. Great Project. Will it work with Winbuilder 080? I finished the test now and it worked, just as the version 078_SP#. Those screenshots warp wb a decade ago..
How can I start whole file Win98LiveCD.iso from grub4dos? I have tried building W98 LiveCd using WB075Beta5 on windows 98SE with no sucess. I get errors when WB is processing 01-WIN98_BASE.script. WB than Halts and the processing is stoped. Can anyone help? is something missing? The erors are Failed to copy ... or Failed to Extractfile respectively. Two posts above yours there is an actual report that it works BOTH with 078_SP# AND 080. Usually using an older version of the Winbuilder engine is NOT advised. Try again with latest 080. Even if it fails, post the WHOLE log, possibly compressed into a .zip or 7-zip archive. It’s a really cool project. Almost incredible! I was looking for it for a long time!! OS started without any problems. But can author or anybody tell me how can I make it to play audio and video?? And is it possible at all? Using grub4dos, it would be interesting to boot Win98LiveCD.iso located in the hard disc. Is there a way to do it? NO, idon't think you can "as is". The .iso as it is set now looks for certain files on the "physical" CD drive. and use it to map the .iso into it's RAMDISK. Cannot say if there will be conflicts with xmsdsk, though, nor what may happen at the windows re-boot. Thanks for the technical information. Much appreciated.